Theropoda IV: Dinosaurs Take Wing! 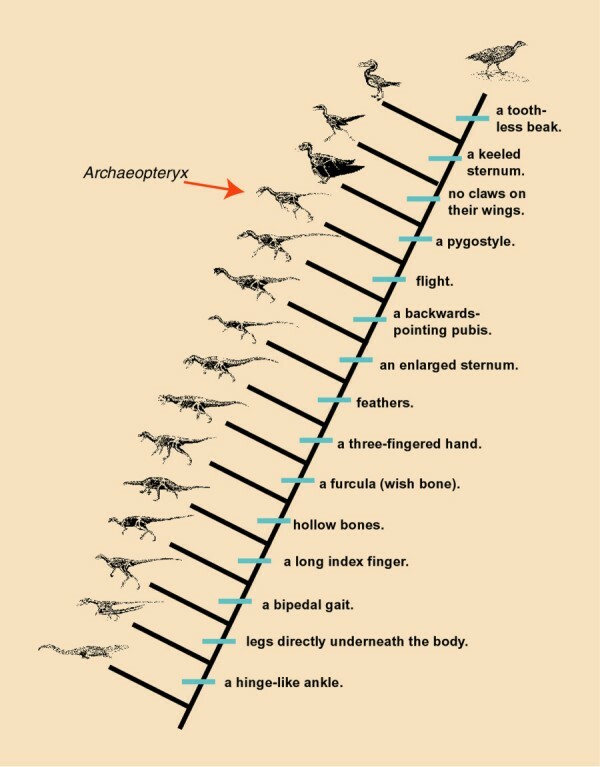 Under cladistics, birds are the descendants of dinosaurs. As such, they are descendants of the most recent common ancestor of Megalosaurus and Iguanodon. Birds (Aves) are a type of dinosaur! How do birds fit into dinosaur phylogeny? In other words, modern birds (the members of Aves) are carinate ornithurine ornithothoracine pygostylian avialian eumaniraptoran paravian maniraptoran maniraptoriform tyrannoraptoran coelurosaurian avetheropod tetanurine neotheropod theropod eusaurischian saurischian dinosaurian dinosauromorph ornithodiran archosaurs. New discoveries have shown that many "avian" features are much more broadly distributed among dinosaurs. For instance, Coelurosauria seems be characterized by feathers in the broad sense, and Maniraptora by true (vaned) feathers. Feathers were thus symplesiomorphies of birds, NOT synapomorphies! Recent study on primitive modern birds suggests wings evolved first to aid young (and small adults) in Wing-Assisted Incline Running: using their wings to generate traction to help them run up sides of trees, cliffs, etc. Later modifications allowed true flight. If true, this behavior was probably present in all small maniraptorans, and not just birds. Because of the cladistic position of Aves, we now know that Dinosauria is not extinct! (In fact, it outnumbers mammal species 2:1).